Swansea have enquired about signing Leicester City striker Leonardo Ulloa. Swans chairman Huw Jenkins admits the club need two strikers as Andre Ayew is their only central option. Bafetimbi Gomis is set to join French side Marseille on loan while Alberto Paloschi has gone to Italian side Atalanta and Eder to French side Lille. 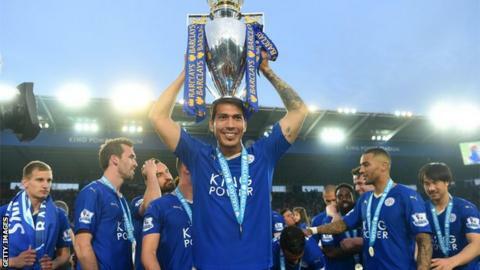 Ulloa played a key role in Leicester's Premier League title win last season, scoring six goals in 29 matches, and has been linked with a £15m move. Leicester boss Claudio Ranieri has dismissed any "speculation" about the champions selling the Argentine striker. And Ranieri insisted to the media on Friday that Ulloa is "very, very happy" at the King Power Stadium and has no plans to sell the player Leicester signed on a four-year deal for £8m from Brighton in July 2014. "He works hard in training sessions so I am happy with him and all of my players," said Ranieri. "My plan is to keep all of my players." Swansea have money to spend after a US consortium purchased a 68% stake in the club, but missed out on a reunion with Wales midfielder Joe Allen. Jenkins revealed Swansea are keen on signing Tottenham Hotspur attacker Nacer Chadli and the Belgium international has been linked with a £15m move. Ulloa told the Leicester Mercury that he is happy to remain with the champions. "Yes, I am happy because the group is very good," Ulloa said. "The team also, and the club is getting stronger. I am very happy here. "I like to play every game if I can, from the start, but if I can't start then I want to make a contribution, I want to help the team. "Always I am ready to play. I work every week for that. I like to play and it is always helpful when the player feels important in the group."